Our simple, but one-of-a-kind change mat cover, was first designed and created to help my sister and I with nappy change time. With three bubs under three years old, we were changing a lot of nappies! We were spending a lot of time at the change table, but the change mat covers we were using simply weren't working for us. In the beginning we used all fabric change mat covers which we were washing constantly. We found that we would end up resorting to towels, disposable covers (expensive and not environmentally friendly) or just the cold plastic mat itself. In a light bulb moment, we thought that if we could have a soft warm material on the top half of a change mat cover for our babies heads, and a wipeable bottom half (where the business happens) then we would solve our problem. We could still keep our babies comfortable and warm whilst being able to wipe off any 'mess' fast and fuss free. Additionally, we had less washing, saving us much needed time and we saved money not buying disposable covers. We made prototypes to try and we loved them so began selling them to our family and friends who loved them too! This, in a nutshell, is how Bubs First was born. My sister Bec and I (Kim) feel so fortunate to run the business together on the daily whilst raising our little's Ayla, Tai and Savannah. We are also lucky to have our own mum and younger sister work with us in the business from the beginning too. Since 2015 we have sold thousands of change mat covers in Australia and around the world. We love our change mat covers because they are both stylish and functional, helping anyone who changes a nappy. No need to spend time washing your change mat cover after every messy nappy change. Our PUL fabric can easily be cleaned/ wiped using a baby wipe or damp cloth. You’re not washing your mat as many times which means you’re saving on water consumption. Rather than using countless disposable mats you can use the same great product over and over again. The minky fabric used not only looks beautiful, but is also a great texture that you and your baby will love. With our range of colours, you are sure to find the perfect fit for all babies’ nurseries. Our covers can be easily adjusted to suit most change mats. Simply pull and tighten for the perfect fit. Before I was using a white terry towelling change mat cover it wasn't wipeable so I had to wash it everyday. I'm loving this change mat cover and its awesome because it's wipeable. The material is really beautiful, the top is really plush and the bottom is still quite comfortable. I'd absolutely recommend it to everybody. I was using an all minky dot fabric change mat cover before using Bubs First. With my previous change mat cover I found that it was always getting really messy and cleaning up those messes was such a nightmare especially in the middle of the night. 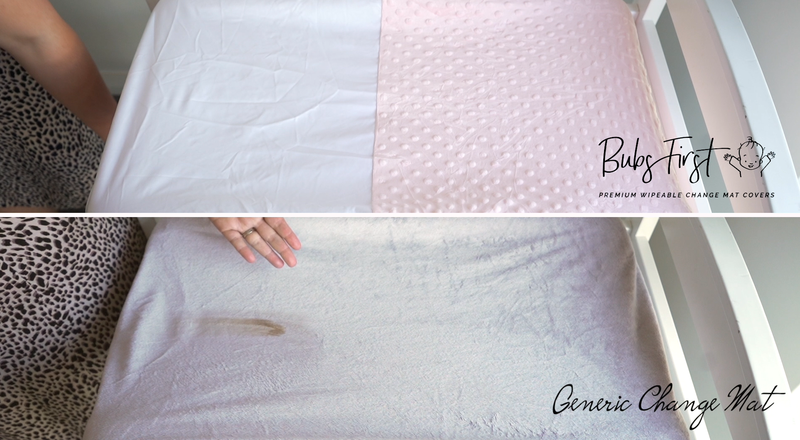 I no longer have to worry about washing my cover constantly and am mess free after every nappy clean. Keeps Bub and I happy. With my previous Change mat cover I found that i was washing it all the time and it stained really easily. After a while I found it getting a little rough on my baby's skin. I love it, it's fantastic and my husband particularly likes it and finds it really easy to use. It's really great because it's adjustable. I would definitely recommend Bubs First change mat cover to any families out there. SUBSCRIBE TO OUR NOTIFICATION LIST TO FIND OUT FIRST ABOUT NEW PRODUCTS, COMPETITIONS AND MORE.